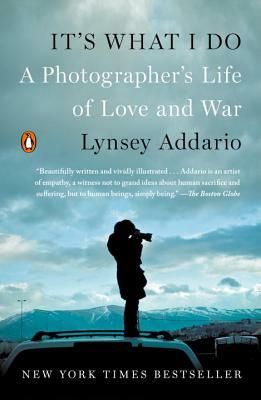 War photographer Lynsey Addario’s memoir is the story of how the relentless pursuit of truth, in virtually every major theater of war in the twenty-first century, has shaped her life. What she does, with clarity, beauty, and candor, is to document, often in their most extreme moments, the complex lives of others. It’s her work, but it’s much more than that: it’s her singular calling. As a woman photojournalist determined to be taken as seriously as her male peers, Addario fights her way into a boys’ club of a profession. Rather than choose between her personal life and her career, Addario learns to strike a necessary balance. In the man who will become her husband, she finds at last a real love to complement her work, not take away from it, and as a new mother, she gains an all the more intensely personal understanding of the fragility of life. Watching uprisings unfold and people fight to the death for their freedom, Addario understands she is documenting not only news but also the fate of societies. It’s What I Do is more than just a snapshot of life on the front lines; it is witness to the human cost of war. Lynsey Addario is an American photojournalist whose work appears regularly in The New York Times, National Geographic, and Time magazine. She has covered conflicts in Afghanistan, Iraq, Lebanon, Darfur, and the Congo, and has received numerous awards, including the MacArthur Genius Grant. In 2009, she was awarded the Pulitzer Prize as part of the New York Times team for International Reporting.